In this guide to pushing and pulling film, we will explain what it means and why you would choose to push or pull your film. Pushing or pulling film is when you rate your film at a different speed from the one written on the box. Then, you compensate for the difference when you develop it. Pushing will mean giving the film a higher rating and pulling a lower rating. 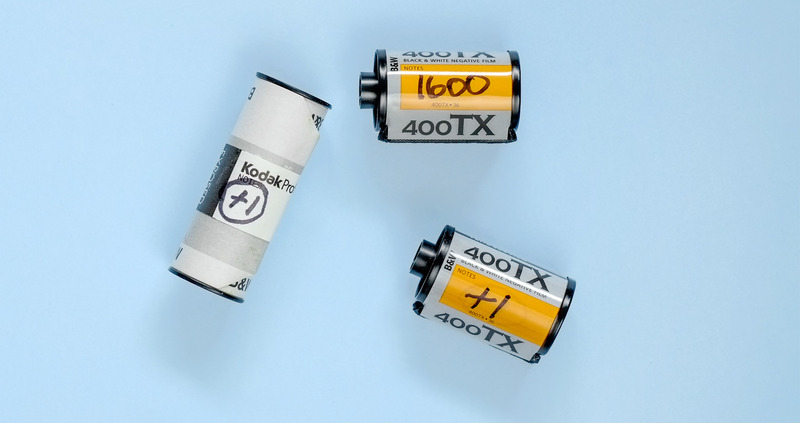 If you’re unsure about rating film have a read of our Guide To Film Speed. Manufacturers ISO is set to achieve mid grey at the correct light reading. Keep this in mind when setting your exposure. So, you will want to overexpose your film to achieve brighter whites and underexpose to achieve full black. When you push film you are underexposing the film. So you give the film less light and make up for it when you develop it. Film is pushed in stops. A stop is doubling the speed of the film. So, a 400 ISO film pushed a stop (+1) is then being rated at 800 ISO. The same film pushed two stops (+2) is rated at 1600 ISO. Remember that when you push, what isn’t recorded on film can’t be brought back with development. You should set your ISO to get the best balance between shadow and highlight detail. Pushing film actually refers to development. Pushing means a longer development time and increased contrast. When you tell the lab you have pushed a film +1, they will know it needs extra development. Pushing film will give you more contrast and more grain. When you pull film you are overexposing the film. So you give the film more light and make up for it when you develop it. When you pull a film by a stop you are halving the speed of the film. So, a 400 ISO film pulled a stop (-1) is then being rated at 200 ISO. The same film pulled two stops (-2) is rated at 100 ISO. Pulling film means a shorter development time and reduced contrast. When you tell the lab you have pulled a film -1, they will know it needs less development. Ultimately pushing and pulling film refers to the development. Pushing means a longer development time and increased contrast. Pulling is a shorter development time which reduces contrast. During normal development the shadow areas will fully develop first, whilst the highlights will continue to build up density during the development. So, a shorter development time (pulling) will reduce the density of the highlights, which will reduce the contrast of the negative. Conversely, extended development (pushing) will increase the density of the highlights and the overall contrast. Pushing works well with traditional grain black and white films like Kodak Tri-X and Ilford HP5. However, it isn’t always as successful with more modern emulsions, such as the Ilford Delta or Kodak T-Max films. Pushing colour films, like black and white, will increase the density in the midtones and highlights. It will also give you an increase in saturation. The professional quality colour films, such as Kodak Portra or Fuji Pro 400H, will stand up to pushing better than budget options. Pulling colour film will start to reduce contrast and saturation. Although C41 colour film doesn’t necessarily need to be pulled in development, as it can easily handle a couple of stops of overexposure. As a general rule, you should expose for the shadow to capture all the detail in the darkest area of the image. The development is used to control the density of the highlights. When pushing and pulling remember to tell the lab when you drop your film off. Some labs will charge extra for pushed and pulled film. Most will be happy to process +2 stops, but might not go beyond that.